The reign of Queen Mary is popularly remembered largely for her re-introduction of Catholicism into England, and especially for the persecution of Protestants, memorably described in John Foxe's Acts and Monuments. Mary's brief reign has often been treated as an aberrant interruption of England's march to triumphant Protestantism, a period of political sterility, foreign influence and religious repression rightly eclipsed by the happier reign of her more sympathetic half-sister, Elizabeth. In pursuit of a more balanced assessment of Mary's religious policies, this volume explores the theology, pastoral practice and ecclesiastical administration of the Church in England during her reign. 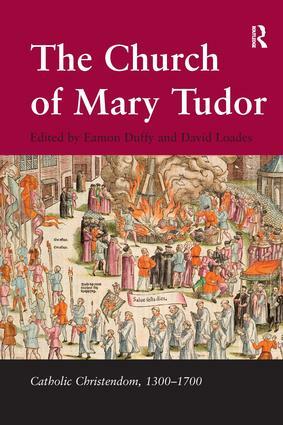 Focusing on the neglected Catholic renaissance which she ushered in, the book traces its influences and emphases, its methods and its rationales - together the role of Philip's Spanish clergy and native English Catholics - in relation to the wider influence of the continental Counter Reformation and Mary's humanist learning. Measuring these issues against the reintroduction of papal authority into England, and the balance between persuasion and coercion used by the authorities to restore Catholic worship, the volume offers a more nuanced and balanced view of Mary's religious policies. Addressing such intriguing and under-researched matters from a variety of literary, political and theological perspectives, the essays in this volume cast new light, not only on Marian Catholicism, but also on the wider European religious picture. Eamon Duffy is President of Magdalene College, Cambridge, and Professor of the History of the Christian Religion at the University of Cambridge. David Loades is Emeritus Professor of the University of Wales, Honorary Research Professor at the University of Sheffield and Director of the British Academy John Foxe Project.